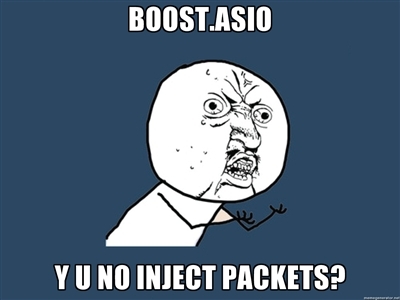 This past week I got to play with the cross-platform Asio and Boost.Asio C++ libraries for socket programming. Unfortunately it turns out what I was trying to do (inject network packets) is not possible with these libraries, but in the process of trying to get that to work I was able to use the basic_raw_socket template class successfully, which it looks like several other people on the Internet are having trouble with. So I’ve written up a GitHub repository with the code and a pretty detailed README. I hope it will help others understand how to use raw sockets in Asio better.